As Chris's club foot and moon face shrank back to normal size, we were really excited to have our first visitors from the US join us in Granada for a week. Driving to the Managua airport to pick up our friend Laurie, the first to arrive, was a bit of an adventure. You might think that the capital city of a country as well as its only international airport would have some road signs indicating the correct direction, but then you wouldn’t be in Nicaragua. After many wrong turns, we had the metal Honda emblem ripped off the back of our car while the windows were being washed at a stoplight, and got directions from a 10-year old girl selling ducks at an intersection to finally make our way to Managua International Airport. Steve successfully navigated the Managua airport on his own the next day, and luckily he did not have to resort to using his Spanish flashcards to communicate with the cab driver. The four of us wandered the colonial streets of Granada, explored some old churches, enjoyed a horse-drawn cart ride to better see the city, ate some lovely meals in pillared courtyards filled with tropical flowers, and lounged around our hotel pool while chowing down on Christmas cookies that my mom and sister had sent to me using Laurie as their mule. We also took a bone-jarring 4WD drive up the steep slopes of nearby volcan Mombacho to explore the cloud forests covering the peak and peer into the dormant volcanic craters. However, due to split pea soup fog, all we managed to see was a sloth hanging from the branches of a tree. 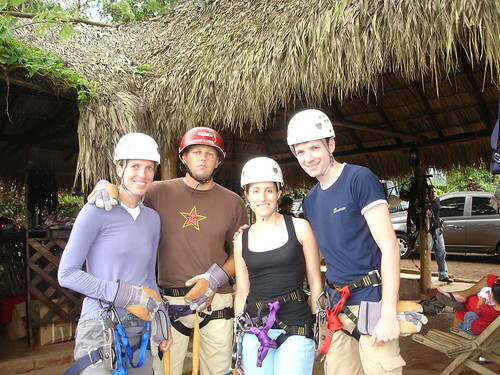 Much more exciting was the zip-line trip we took through the jungle canopy. The local guides whooped and hollered as we sped from tree to tree, snapping on our safety harnesses and pushing us off the platforms with glee. The four of us wanted to check out the beaches at San Juan de Sur, but renting a car or taking a bus to our next destination was too expensive for our tastes. 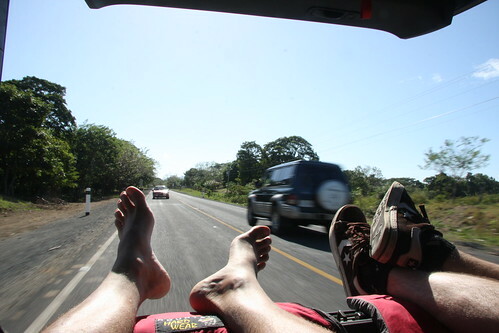 Instead, we kicked it Nica style and drove with Steve and Chris laying in the back of our car with the hatchback open . I know, I know, the real Nica style is having 10 people packed in the back of a pickup truck, but you have to give us an A for effort. With all that money saved on bus rides, we decided to splurge when we arrived in San Juan del Sur and rent a sweet condo in the hills looking down on the turquoise horse-shoe shaped bay. It was still a steal by United States standards, but for us budget travelers having three infinity pools along with a private deck equipped with a bar and rocking chairs was heaven. We enjoyed two days lounging on the beach and by the pool and playing poker while sharing litros of Tona, the Nicaraguan beer. We then headed back to celebrate the New Year in Granada. 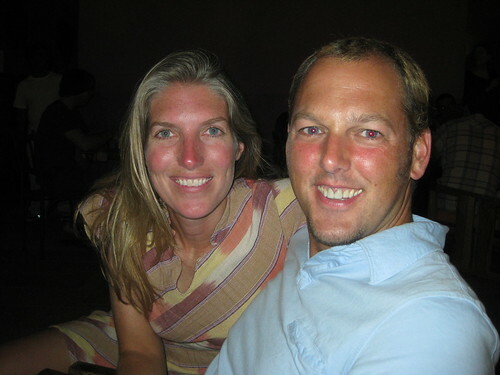 Steve and Laurie were great sports and stayed out quite late considering they were catching a 4 am taxi to the Managua airport the next morning. I really like the photo with your feet hanging out of the back. Keep it up and when or if you goto ecuador and need any insider info, let me know.